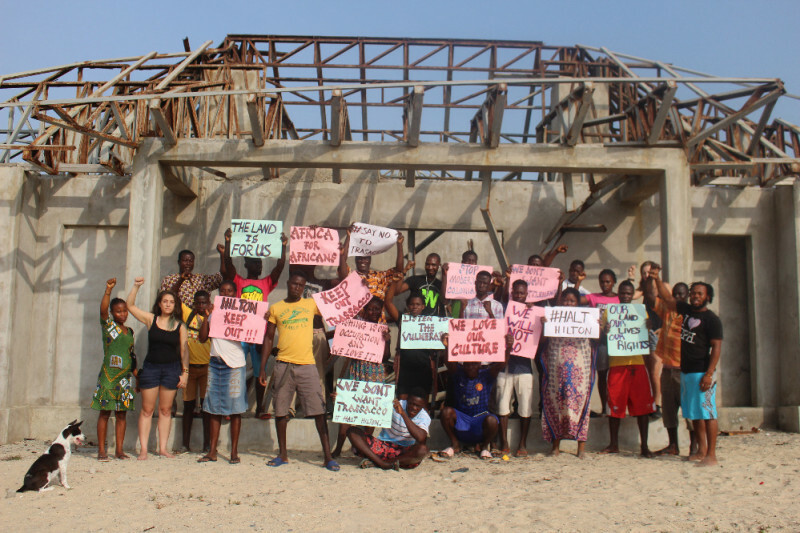 Apr 6, 2018 — At the beginning of the third week in March our team received news that Trasacco- a company which has been threatening to displace Kewunor community at the Ada Estuary in order to build a private resort which will be managed by Hilton Hotels- was hosting a stakeholders meeting in Accra but had not invited any members of Kewunor community. Through great efforts and negotiation our team was able to bring 10 people from the community to a meeting of about 60 people including many district chiefs, and surrounding community members. On arrival it was made clear to us that some of the chiefs were upset by our presence, but because we were already at the meeting, there was nothing they could do. We were told many times keep quite unless we had ‘intelligent questions’ and that the community members should not disturb the meeting. When CEO Ian Morris began the next section, he started by talking about all the good Trasacco has done and will be doing for Ada and the project. He mentioned many things which the community had never seen including a beach clean up fund which he claimed was using 2,500 cedi’s a month since 2014 to clean the beaches. He also mentioned the establishment of an eco foundation which would be funded by the hotel to monitor the delta and to protect the turtles. However, with his first statement about the beach clean up being false we wondered how reliable the company was concerning the eco foundation. He also mentioned stocking some lagoon with fish and training locals to manage it for the hotels food supply. When speaking about the community the company almost always used derogatives saying the community was living in poverty, that there was trash everywhere, and that the quality of education was very low. They showed pictures of the refuse dump in the community and of the JHS while it was under construction. Of course, it is in the company’s interest to paint the community in this way because from that idea they showed their resettlement plan in comparison to say that it is a much better standard of living. However, most people in the community do not consider themselves to be living in poverty, and many have been working very hard to develop the school, the women’s group, the fishermen’s association; and have been making plans for a harbor, more bathroom facilities, and more tourism. The resettlement plan the architect Mr. Theo Obeng Sackey spoke about is sited about 1.7 km from the current location of the people resting on the ocean side of Ada, and will resettle 177 people according to a 2014-2015 census which they took (which we know to be a gross underestimate). The attached housing units would be one bedroom and two bedrooms with a communal bathroom and laundry facility. He stressed the great improvements this plan would bring to the people saying that the concrete houses alone would improve their current situation since many residents live in thatch housing. However, the resident of Kewunor live in thatch housing because when they used to build concrete buildings on the sand, the erosion would cause the structures to crumble prematurely, to find a solution they built movable housing which could adapt to the ever-shifting sands. Additionally, in the community now, almost every family has their own compound, and if they were to be moved to attached housing there would be no options for them to expand their house to accommodate their family unless they lived at the end of the unit. There was also no explanation about where the fishermen would park their boats, or weather they will still have access to the river at all. The whole resettlement plan- stated so confidently- seemed like it was prepared for a totally different community, and indeed it was not made for the people of Kewunor because it was drawn without them, and without community participation in their own resettlement scheme how can any company claim to know what the people want and need? Only the people themselves can do that. This plan had clearly been drawn up in an office very separate from the people, with the company’s pocket book on the mind of the architect. The school they proposed made no mention of which levels would be offered, weather there would be a kindergarten, or primary or JHS? These are only some of the obvious details which Trasacco left out of its presentation. Additionally, CEO Ian Morris stated that the project would not extend beyond the current school, which made us question why one of the site plans seemed extend the whole community and into Azizanya. The final section of the presentation outlined the direct and indirect benefits of this hotel project mentioning jobs, local material purchases, laborer training, increased transportation as direct benefits and increased tourism causing more inflow of foreign currency into the area as the major indirect benefit. Yet there was no mention of the potential negative impacts including the fragmentation of the community because the company is proposing to resettle only a portion of the people and how that will disrupt their traditions and culture and effectively create a new displace and exiled community. When it came time for questions CEO Ian Morris stated that there should not be too many questions because this was not a good place for discussion, despite this chilling comment, many community members courageously spoke out asking for answers concerning the privatization of the estuary, the number of people to be resettled, how the plan had been created without the community involvement and one member of the community called on the company to stop the project until they come to the community and talk with the people who will be most affected, after making the point most non community members in the room began to laugh, and people tried to order him to sit down. Not only did the executives refuse to give real substantial answers to these questions, but when CEO Ian Morris was asked if his company could ensure that going forward the community of Kewunor who will be most affected by this project would be involved in all negotiations and given all relevant documents, he stated that there was no ‘legitimate group’ or person that they knew of whom they could have communications with, and that they will not communicate with any group claiming to represent the community (which we can only assume was pointed at our group the Kewunor Advocates). This comment in addition to being a flagrant disregard to the rights of the people was a great insult to the community who has been trying for many years to be included in negotiations. The media outlet Joy FM also attended and recorded the meeting and wrote the subsequent article which excludes almost every major event from the meeting only noting that the 300 room hotel would bring jobs to the area. An additional insult is that Joy News had already come to the community, interviewed many people about their concerns about the project and went back to Accra to produce a story sympathetic to the peoples plight which never aired. It seems the community only served them as a pathway to working with Trasacco. After the meeting many community members were rushed and threatened by local chiefs who said they should be very careful about what they are doing and saying and that they could be sued. All in all we are very disappointed in Trasacco for continuing to refuse to include the community who suffer in their hotel project and resettlement scheme, in Hilton for their lack of interest and disregard for the human rights of the community, and in the chieftaincy for not taking up their mantle to protect and serve the rights and freedoms of their people. Please share my name and email address with Volta Revival Foundation, so that I can receive updates on this campaign and others.